Steel Deck plays an important role in the replacement of wood and it is an essential component in the construction industry. 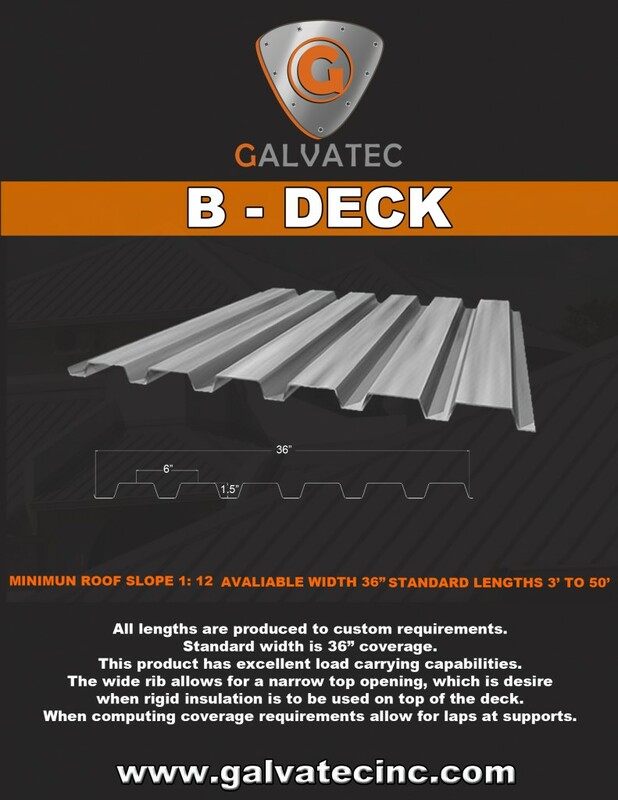 B Deck – Panel is the most common structural roof deck and it is easy to install. It is a system based structural metal sheet which is fixed to the primary structure with a special wrap allowing the anchoring to the concrete and at the same time, it serves as formwork for the slab while working with the formed profile as a kind of nerve. It is used in a variety of applications such as roof screens, trash enclosure gates, roofs, awnings, canopies, etc. Steel Deck acts as reinforcing steel and formwork and it operates similarly to a beam working as a composite section. B Decking is usually installed in short to medium span conditions ranging from 3 feet to 10 feet in distance. Material can be custom run to longer lengths if needed. It is 1 1/2″ deep and it is in stock in the following gauges 22, 20 and 18 Gauge. The system consists of Concrete Profile Formed Deck, shear bolts and steel beam. It is economical, lightweight, strong It is available in lengths ranging from 6′ to 40’. It is designed to support the full dead load of the concrete before setting. After the concrete acquires its own resistance, overload design is supported by the composite section where Steel Deck provides positive reinforcement of mezzanine. It has an efficient pattern of longitudinal wrapping located in each channel profile and act as mechanical connectors that help increase the adhesion between the profile and the concrete, also preventing slippage between them and achieving its performance as a single unit. It accelerates construction of simultaneous handling castings at different levels of the building, generating savings in labor and time. The Steel Deck system consists of corrugated galvanized steel sheets on which the concrete is placed forming a set working integrally thanks to the adhesion of the concrete to the sheets through the notches they have for this purpose and connectors cutting must be placed properly. The film creates a membrane stability and resistance against seismic effects, when creating the effect diaphragm in the slab. Cleaning the null woodworking, wires, etc., and safety for its rigidity to traffic loads.